Next-gen pathway analysis using Advaita’s proprietary “Impact Analysis” method to identify significant pathways without all the noise found in other approaches. iPathwayGuide provides publication-ready results in minutes. Access up-to-date gene annotations including miRNAs, biological processes, cellular components, pathways, SNPs, drugs, diseases, etc. iPathwayGuide provides a user-friendly interface to investigate the genes of your interests, saving valuable time and effort. Our gene annotations come from many public data sources, as well as literature mining. Our knowledge base includes many recent papers that are not yet available from NCBI. Our proprietary Impact Analysis quickly identifies the significantly impacted pathways based on two forms of evidences: Over Representation Analysis, and Perturbation Analysis. All other pathway analysis approaches consider the pathways as simply sets of genes ignoring the biological processes that the pathways are meant to describe. iPathwayGuide is the only pathway analysis tool that uses a system biology approach and includes in the analysis the type, function and interactions between the genes on all pathways. Choose from a variety of correction factors including Elim and Weight pruning methods that take hierarchical relationships into consideration. Identify and explore annotated genes, and view hierarchy plots of the various GO terms. iPathwayGuide provides a novel predicted micro RNA (miRNA) analysis based on your gene-expression or protein-expression data. This analysis allows you to identify miRNAs that may be active in your conditions, identify targets, and generate new hypotheses. iPathwayGuide analysis includes finds enriched diseases under the ICD-10 classification. 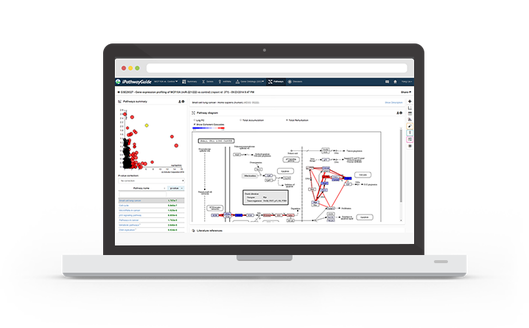 Quickly zoom in on groups of diseases and see significantly expressed genes from your data that are annotated to each disease. Choose from a variety of correction factors including FDR. Identify and explore annotated genes, references, and more. iPathwayGuide is the only platform that allows for a meta-analysis across multiple conditions. Quickly identify genes, pathways, micro RNAs, GO terms, or diseases that may be in common or unique across your data. You can even build custom meta-analyses based on other data sets you may already have. iPathwayGuide brings the most advanced pathway analysis platform to you. Unlike other pathway analysis approaches that assume all genes to be independent, iPathwayGuide considers the size, role, and position of each gene on the pathway as it models high-throughput sequencing data. This advanced approach allows users to quickly prioritize targets and pathways, avoiding false positive and false negative results. We release 2-4 newsletters every month with product updates and promotions. Please subscribe to our newsletter.